Discover the latest news about Albuquerque's most exciting new restaurant, Hartford Square. Be the first to know each week's newest culinary creations for breakfast, lunch and dinner. We are located in East Downtown Albuquerque, New Mexico. The Old Windmill Dairy, in Estancia, NM is a well-hidden treasure worth looking for. I have been enjoying their wonderfully-flavored award-winning chèvres and other specialty goat and cow's milk cheeses for many years, and plan to carry some in our market and (of course) use it as an ingredient in our food. This is an old-fashioned, artisan, hand-crafted cheese-making operation right outside of Albuquerque. I find Old Windmill products at our local growers markets and also at La Montanita and Whole Foods. To find the dairy itself, we headed east from Albuquerque and then south from Moriarty to Estancia-- then turned down a long dirt road heading west again. Eventually we came to Paso Ranch Road, where we turned north, and then looked for the green cheese-making building and the red barn on the left. At that point, it was hard to miss all the goats! We headed out there for a Mother's Day weekend adventure, last Saturday, to visit the baby goats and see where the cheese is made. The kids ran up to us immediately-- very friendly and rambunctious and totally ready to eat my shirt. Their moms were mostly pretty mellow (and the dads even more so)-- but the babies were literally bouncing all over the place! Ed and Mike, who started the business back in 2002, welcome visitors to their goat farm. They are happy to share the experience of spending time with the goats and-- if you show up at feeding time-- helping them to feed the babies. This spring over 300 babies were born. The girls stay on the farm to become future milk producers, while the boys all find new homes as pets for other lucky people. These Nubian goats (who all have names) have the highest butterfat ratio of any breed in their milk, which is why it makes the best cheese. They eat a healthy, nutritious diet and enjoy life on an eco-friendly farm that supports our local economy in many significant ways. The young goats are hand-fed almost from birth, which helps make them more comfortable with people and ensures that they all get enough to eat. The various cheeses and flavors of chèvre made here reflect the mission of the dairy and the unique characteristics of the state of New Mexico-- think Holy Chipotle, Chile 'n' Hot, Sandia Sunrise Smoked Gouda or Turquoise Trail Triple Cream Cambozola, to name but a few. 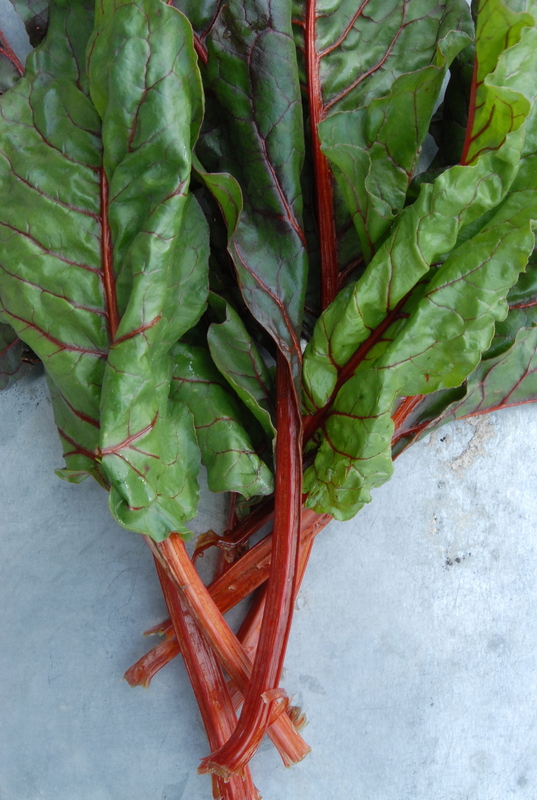 These make an awesome appetizer or a side dish with eggs & potatoes-- or a topping on a bed of fresh local greens! 1) Carefully spoon a small amount (and I really mean small-- use a 1/2 tsp measuring spoon, a demitasse spoon or even a sharp-nosed grapefruit spoon) of soft chèvre into each open squash blossom, and twist the end shut. 2) Make a mixture of beaten eggs, a pinch of salt and a splash of milk (about one egg per 6 blossoms) in a shallow bowl. 3) In another shallow bowl, place flour or finely ground cornmeal or breadcrumbs about one inch deep. 4) Carefully dip each stuffed blossom into the egg mixture and then into the flour, coating entire blossom each time. 5) Gently rest on a plate until all blossoms are prepared. 6) Heat enough olive oil over med heat to cover bottom of sauté pan about 1/4". 7) When oil is hot, carefully lower each blossom into oil, and do not crowd them. 8) They will turn golden brown on one side fairly quickly, so roll them over with tongs to brown the opposite side. 9) When crispy and golden brown, remove from pan, taking care not to squish them. Drain on a paper towels, and serve warm. DON'T feed them to the goats! how to prepare soil, various organic farming techniques and how to extend the growing season. Row covers they built contributed to the abundance of mature crops being harvested now. The project began in January 2012, and continued through this past winter, up to the present. The produce grown through the project is sold by the Vets every week at a grower's market on the VA Medical Center campus in Albuquerque. So, in addition to the farming business training and therapeutic benefits, they also receive a small economic benefit as well. In its first year, about 15 Vets participated. As the program continues, the goal is that more and more Vets will be ready to take part in the local farming community. There are other groups involved with the Urban Farm project, as well. Amy Biehl High School maintains three raised beds as part of their curriculum. PNM has contributed volunteers to build infrastructure such as trellises at the site, and the US Fish & Wildlife Department is planning to plant trees around the perimeter of the area, and to possibly create a wildlife habitat at the west end of the block. The Downtown Action team has also been bringing us a Spring Grower's Market as a preview to the regular Downtown Grower's Market. It sets up on Gold Street between 1st & 2nd through May 11. The Agri-Cultura network growers are offering their wonderful produce, and a number of other vendors are participating. This is a nice opportunity to pick up some organic plants for your own garden, too. And don't forget-- from May 18 through November 2, the full-blown Downtown Grower's Market at Robinson Park (Central & 8th) will be underway once again. This is a major event every Saturday from 7am until noon, with about 90 vendors and 1500+ attendees, generating $1,000,000 in sales, annually. There is always great music, plenty of local food and produce and also a variety of arts & crafts available. If you have never attended, now is the time! Grab your kids, your dog and/or your friends and head on downtown. We Love the Grower's Market! My goal for Hartford Square has been to find a compatible company that roasts and sells its own coffee beans. I have been looking for both local and good. After quite a few tastings and an awfully lot of caffeine, my wanderings led me to a place where I thought (based on past experience and a lot of research) that I might end up-- Michael Thomas Coffee Roasters on the south end of Carlisle Blvd. I explained my mission to Michael, and he very generously supplied me with quite a few samples of freshly roasted beans, to continue tasting and comparing at home. After tasting quite a few, I went back and we worked out a coffee plan. We will offer an espresso, a dark roast, a decaf and also a medium roast "signature blend" which Michael will develop with us. I am so glad that we will be working with this great company! Michael Thomas is a micro-roaster whose business is built on high-quality coffee and its connection to community. Their coffee shop is an integral part of their neighborhood. It is both a gathering place and a community resource-- a place to learn about and enjoy a variety of freshly roasted beans and the numerous coffee drinks made from them. This is an inspiration to me, and I am thrilled that we will be working with them to come up with the perfect roasts to sell and brew at Hartford Square. We won't be able to provide the same depth and breadth, but it would be great if we can build the same kind of commitment to quality and community! So... we have gotten a bit of snow. Mountain peaks are sprinkled with white and skiers are happier. And despite the snow and cold, there are some green things growing. Eager gardeners have already started cold-weather crops in greenhouses and cold frames. I have been planting lettuces, spinach, chard, kale, collard greens, arugula, cabbages and more in planter boxes by my kitchen door. Little plants are poking through-- and some very hardy ones have survived outdoors in protected pots and beds, occasionally dusted with snow. I have a little chard and kale that survived the winter, so far. I was wondering if it would be possible to find local greens for sale somewhere nearby (It seems like forever until the Downtown Growers' Market will open again). Well, guess what? I somehow missed the fact that the village of Los Ranchos has a market which goes through the winter-- they are open on the second Saturday of each month. They are on Rio Grande Blvd, at the parking lot near the tennis courts, which is really not that far away at all. The March Grower's Market happened on the 9th-- one of those late winter New Mexico days when the weather was changing so fast you couldn't keep up. It snowed, it blew, it was dark and grey and then it was sunny. 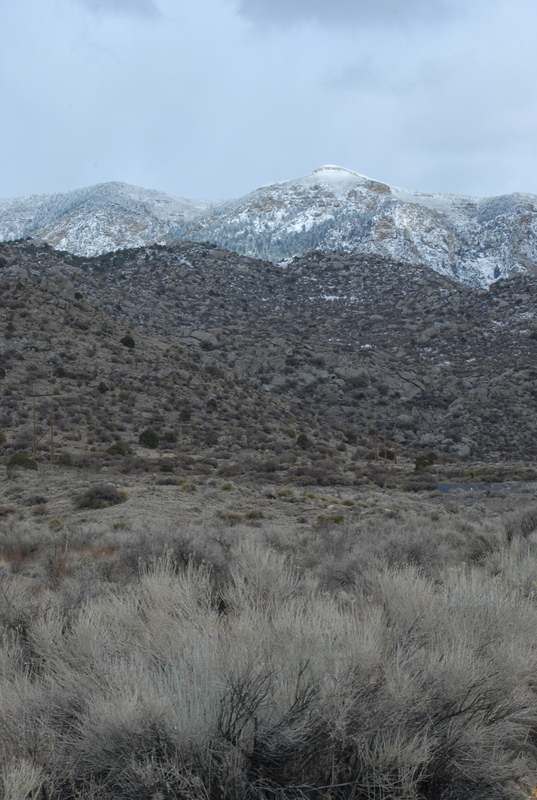 The Sandias were covered with snow in the distance-- and then they were not even visible because of a giant storm cloud. But the Market was on, no matter what-- most of the vendors snugly sheltered inside the big barn-like structure there. A three-person band played Irish music and there were greens and root vegetables everywhere-- a sight for sore eyes! I got to meet some farmers whom I had not met before... Barbara and John from Mananica Farm in Algodones had lamb and wool yarn and also beautiful golden beets and greens including chard, lettuces and kale. Some really nice girls from Stray Dog Farms in the North Valley sold me carrots bundled up with a ribbon, and I met "Farmer Ric" from Sol Harvest Farm, who also sold me some pretty fine looking spinach. These last two farms are now offering "CSA" (community supported agriculture) harvest boxes to those who wish to become members-- check their websites for more information. This is a great way to enjoy fresh seasonal produce from local providers for much of the year, and to get it even when you can't make it to the Market. Then on Monday, I traveled down to the far South Valley to visit Richard Moore at Moore Family Farms. I went with Gina, who runs Fresh Produce-- a company that works to connect many local growers in our area to restaurants here that want to use fresh local produce. Gina told me that she sells about 30% of what Richard grows, and he sells the rest at the Downtown Growers' Market and by word-of-mouth. 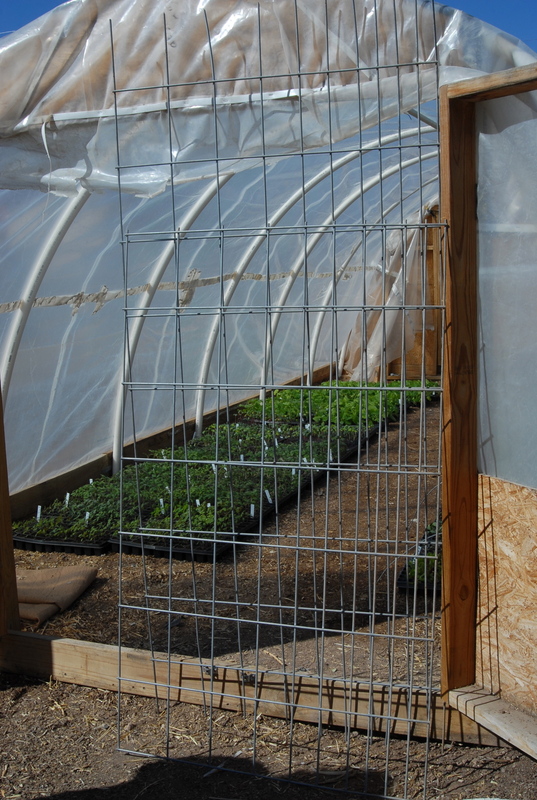 Richard showed us what he has started inside his hoop house-- a simple curved greenhouse wrapped in plastic. Baby plants were everywhere, and half the space was filled with greens-- mustard, spinach, kale, chard and more. He was getting ready to start moving them out into the fields, where he will also direct-sow even more lettuces, arugula and such. Next fall, Richard plans to build more hoop houses, out in the fields, where he will grow greens year-round. This makes me happy, because I hope to be buying them from him! The Growers' Market begins on May 18-- two months away, still. There is plenty of time for Richard to coax his baby plants into big bunches of healthy, hearty spring greens. Look for his produce and farm fresh eggs there all season. And by then, Hartford Square should be open-- and we will be featuring fresh produce from farmers like Richard in our weekly menus at the restaurant. Can't wait! Here is a simple and quick way to use some of those delicious greens and fresh eggs in the same recipe-- just whip up a Frittata w/Hearty Greens for breakfast, brunch or a simple supper. You'll need two eggs per person, a big bunch of chopped chard or kale, olive oil, salt, pepper, 1/2 cup grated cheese per person (your choice-- experiment! ), one or two finely chopped garlic cloves and about half an onion, chopped. Oh, and by the way-- did I mention how GOOD FOR YOU dark green leafy vegetables are? Probably better than almost anything else you could eat-- full of vitamins, minerals, antioxidants, fiber and phytonutrients and low in calories and carbs. What more could you want? I know-- stuff that tastes good-- so how about this: 1) Heat 2 tablespoons olive oil in a 10" (adjust size depending on how many servings you are preparing) skillet (that can go in the oven) over medium heat, and add garlic-- cook until fragrant, for a couple of minutes, then add chopped onion & cook until soft, but not brown. 2) Add chopped dark green leafy vegetable of choice, and cook until liquid releases and cooks off, stirring frequently. 3) In the meantime, whisk desired number of eggs in a small bowl-- when greens have begun to dry up, pour eggs over them to cover. Cook until set on bottom. 4) Grate cheese and sprinkle it over top of eggs. 5) Turn on broiler in oven and set rack about 6" below broiler. Place skillet under broller and broil until cheese is bubbly and eggs are set on top. 6) Remove from oven and let sit for a few minutes. Slice into desired number of servings and place on plates. It really is winter. We do not have any snow on the ground, alas, but still it is winter. Recently the weather has been awfully cold-- even in the single digits. There is not a whole lot being harvested right now in northern New Mexico-- certainly not any fruit. But for one young, up-and-coming Albuquerque entrepreneur, it still seems like it is fruit-harvesting season. Dominique "Mickie" Dupont, the founder of Urban Orchards, is hard at work, continuing to process the fruit that she and her team harvested over the long summer of 2012-- a season that produced an amazing over-abundance of cherries, apricots, peaches, plums, nectarines, apples and pears. Dominique, who has a Master's degree in landscape architecture, recently came up with a brilliant solution to many a local homeowners problem-- too much fruit. There are a LOT of fruit trees growing in this city-- a few here, a few there, adding up to thousands. If you are one of those owners, Mickie will come and harvest all the fruit that you don't have time to pick, so it doesn't end up smashed all over the ground in your yard. She basically sees the whole urban sprawl of Greater Albuquerque as a very, very big orchard. Once she picks your fruit, you simply pay $25 to become a "member" of Urban Orchards. This entitles you to 10% of the delicious jams, jellies or sauces that she makes out of your-- and many of your fellow fruit tree owners-- fruit. The rest she sells in local stores and at the Grower's Markets here in Albuquerque. Her products carry on a family tradition-- rooted in the Alsatian region of France and in New Mexico as well-- of creating very delicious foods from the produce that grows nearby. She has always loved making jams and jellies, and each recipe that she has developed is influenced by that tradition. Her recipes also meet the exacting standards at the NMSU Process Authority in Las Cruces. They test each one to ensure that it is not only delicious, but also safe to store on the shelf. Last summer, she was not only written up in Edible New Mexico, but in Time, as well. Mickie has been interviewed on KUNM radio and her products are showing up in other people's blogs and on the shelves at several small shops around Albuquerque, including Delicious NM Tiendita, Sheila's Sweets, Model Pharmacy, Olo Yogurt Studio, The Grove, The Range and, soon, Hartford Square. And from May until November she and her husband can be found at their booth at the Nob Hill and Downtown Growers Markets. Where does she make all this delicious fruit sauce and jelly? Urban Orchards is one of the many start-up food businesses that have been able to work out of the large commercial kitchen at Bernalillo County's South Valley Economic Development Center. 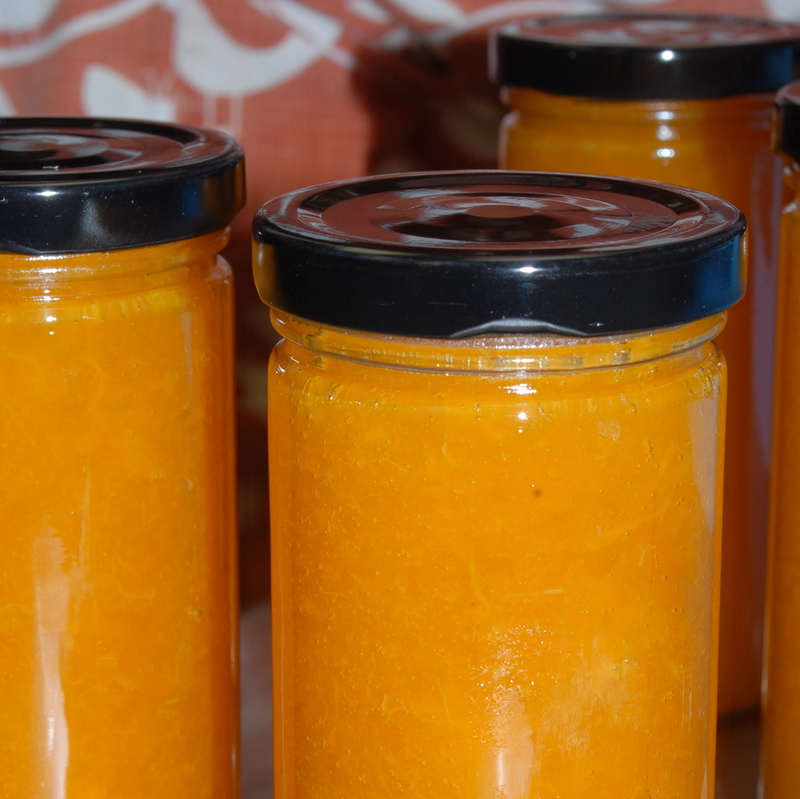 The Urban Orchard team is able to reserve space, whenever they need it, and get to work creating and canning everything from Apricot Sauce to Pear & Apple Jelly. Urban Orchards employs three part-time workers in the busy season, for manufacturing and sales. What's next for Urban orchards? This coming summer, Mickie hopes to be harvesting even more of Albuquerque's vast urban orchard, as she grows her network of members. She also plans to gather together all the many creative and innovative culinary uses people have put her products to and showcase them on her website. Be sure to watch for that, on their website and Facebook page. Her brilliantly-colored sauces capture the essence of those fruits from the hot months of summer, and they are a excellent addition to so many recipes. They are wonderful over french toast and pancakes, oatmeal and granola, yogurt or ice cream...or stirred into a glass of sparkling water or white wine. This recipe is inspired by one I found in a favorite blog, Fresh New England-- I created a winter version, though. Instead of fresh cherries I used jarred Morello cherries and some of Urban Orchards' Cherry Sauce to make the filling. 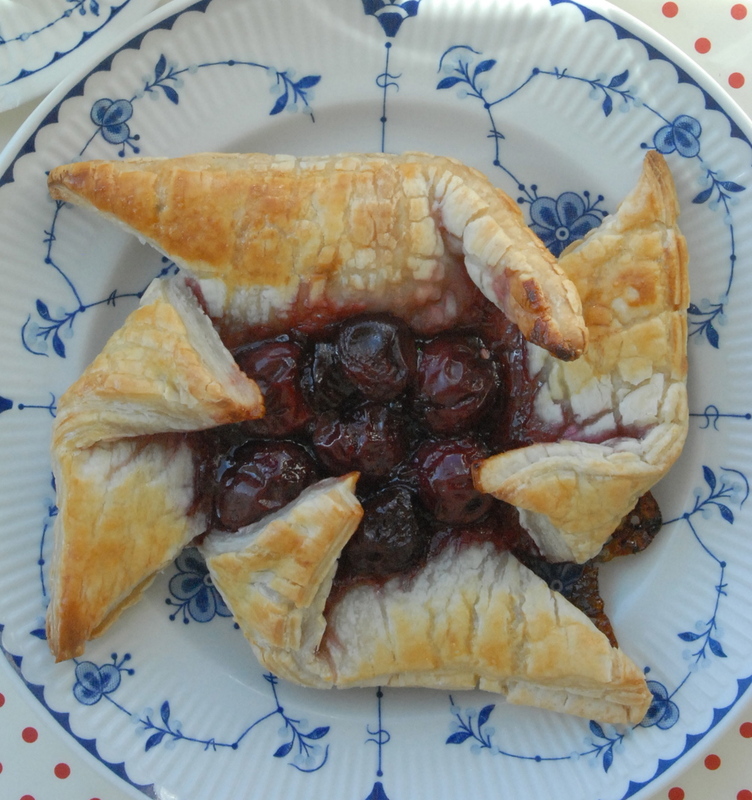 Here is what you do: for two Cherry Pinwheel Pastries, you will need 1 sheet puff pastry, 14 cherries, 1 egg, a bit of confectioner's sugar and some cherry sauce or jam. 1) Thaw one sheet of frozen puff pastry. Fold in half to make a long rectangle. Cut in to two square pieces. Roll each one out to make a 6" square. Cut a 1 1/2" slit on the diagonal in each corner (see photo). 2) Drain 14 cherries. Place one in very center, and six more around that one, so they touch. 3) Spoon about a tablespoon of cherry sauce or jam over the cherries. Fold one side of each section (as shown) in to the center, to create a pinwheel. 4) Mix egg with a fork, and with a pastry brush, carefully brush all of the exposed pastry with the egg wash. 5) Carefully slide pastries onto a parchment paper-covered cookie sheet and bake in a preheated 400 degree oven for about 20 minutes, until golden brown. Cool slightly, and sprinkle with confectioner's (powdered) sugar, if desired. This week I found a new one-- the Stayman. Some orchard owners from Chimayo brought about ten different kinds of apples to the Farmers Market at Albuquerque Academy. I grew up in New England on MacIntosh apples, and I am always craving that same tart, crunchy, crispy kind of apple-- not always easy to find in New Mexico. This one was SO good that I have no idea why I only bought four of them. Not even enough to really bake anything with-- so the girls and I just ate them right up. Then I needed to find out where we could get some more. I did a little research and discovered that Stayman apples have been around since the 1860's, that they are closely related to Winesaps, have a "low-chill requirement" and are suited to warm and temperate climates. Even better, there are several orchards in New Mexico that grow them! In the interests of time and a small carbon footprint, I picked the closest one-- Alary Farm in Corrales. (Open 9-5, Fri-Sun during apple season.) It was a beautiful autumn day-- the kind that makes me want to go out and take a lot of pictures. So off I went. Alary Farm is easy to find-- on the east side of Corrales Road. I got a big bag of Stayman apples and a gallon of cider. The owner let me wander around the orchard, taking pictures and soaking up autumn in New Mexico. Corrales always makes me feel a little bit like I am back in New England-- especially at this time of year when I get the most homesick. It has an almost-rural, small-town feel to it, even though it is just minutes from Albuquerque. And it is full of orchards and gardens and places selling apples and cider. A person could make a whole day of it out there tasting and sampling. These apples made me feel like cooking something up right away. I was pretty hungry after my mini adventure, so I decided to forego baking for something quicker-- French Toast w/Caramelized Apples. Here's what you do: 1) core and thinly slice one apple per serving. 2) sauté apples in some sweet butter. 3) sprinkle w/a few teaspoons of brown sugar mixed w/a pinch each of cinnamon & nutmeg. Cook until sugar caramelizes and apples are turning golden brown. Set aside to keep warm. Meanwhile, prepare the french toast: 1) mix 2 egg yolks, 2 tablespoons milk, 1 teaspoon Calvados (apple brandy) & a pinch each of cinnamon & nutmeg, per serving, w/a wire whisk. 2) soak 4-5 thick slices of french baguette in the egg mixture. 3) toast until cooked all the way through and very brown, on a griddle over medium heat. Arrange french toast on individual serving plates. Spoon caramelized apples over the bread. Sprinkle with toasted walnuts, and top with a spoonful of sour cream or creme fraiche. Enjoy at once... close your eyes and drift back out to those orchards, full of delicious New Mexico apples. We'll have to go back soon and look for the very last apples of the season. And some more cider. Because we already polished that off, too.